Stone tools found in a Florida river show that humans settled the Southeastern United States far earlier than previously believed – perhaps by as much as 1,500 years, says a team of scientists that includes a Texas A&M University researcher. The director of Texas A&M’s Center for the Study of the First Americans, Michael Waters, and colleagues from seven universities and two institutes published their findings in the current issue of Science Advances. Their story has made headlines in the New York Times, the Christian Science Monitor, the Associated Press and other news outlets. Waters teamed with Jessi Halligan, an assistant professor at Florida State who graduated from Texas A&M in 2012, to excavate the Page-Ladson site located about 26 feet underwater in a sinkhole in the Aucilla River, not far from Tallahassee. Their colleagues on the project represented Florida State University, the University of Michigan, the University of Minnesota, the University of Texas, the University of Arizona, Stafford Research Laboratories in Colorado, Aucilla Research Institute in Florida and the universities of Exeter and Cambridge in the United Kingdom. Working in near-zero visibility waters in the murky river from 2012-14, with a team including many Texas A&M students, Halligan and Waters excavated stone tools along with the bones of extinct animals. 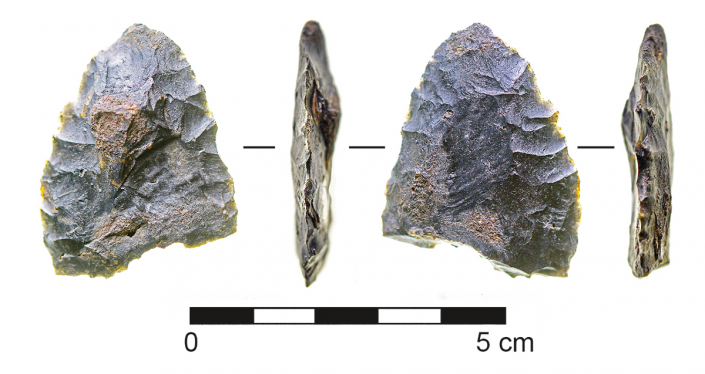 They found tools such as a biface – a knife used for cutting and butchering animal meat – and other tools. They also reanalyzed the mastodon tusk and were able to show that it displayed obvious signs of cutting created when the tusk was removed from the skull. In all, 71 new radiocarbon dates leave no doubt that the artifacts they found date to about 14,550 years ago. It’s believed Clovis – once widely considered the first inhabitants of the Americas – settled in various sites about 13,000 years ago. Clovis is the first widespread prehistoric culture that appeared about 13,000 years ago. Clovis originated south of the large ice sheets that covered Canada at that time and are the direct descendants of the earliest people who arrived in the New World around 15,000 years ago. Clovis people fashioned distinctive stone spear points with fluted bases that are found in Texas and other portions of the United States and northern Mexico. These weapons were used to hunt animals, including mammoths and mastodons, from 12,600 to 13,000 years ago. The project was primarily funded by the North Star Archaeological Research program and Chair in First American Studies at Texas A&M; the Elfrieda Frank Foundation; and the National Geographic Society.